UN says the situation in Gaza is "catastrophic", warns US could create "more misery" by cutting aid to UNRWA. The UN said Wednesday that the situation in Gaza was "catastrophic" after 11 years of "economic siege" and warned that Washington's decision to halt assistance to “Palestinian refugees” would create "more misery". "The situation in Gaza is becoming less and less livable," said Isabelle Durant, the deputy head of the United Nations development agency (UNCTAD), according to AFP. In a new report, the UN agency said the Palestinian Authority (PA) economy was being hit hard by a sharp drop in international support to the Palestinians, even before Washington's dramatic cuts. Last year, international development assistance to the Palestinians shrunk by more than 10 percent compared to a year earlier, the report found. That dramatic drop in support came before US President Donald Trump's administration decided to completely halt its funding for the UN agency for “Palestinian refugees” (UNRWA), which had previously stood at around $350 million a year. The Trump administration has also scrapped around $200 million in payments by USAID to the Palestinians, and last weekend said it would cut $25 million more in direct aid to six hospitals that primarily serve Palestinians in Jerusalem. In a report last year, the UN agency said that the Palestinian economy could easily double and that sky-high unemployment and poverty would plummet if the “Israeli occupation” were lifted. In its latest report, UNCTAD suggested that simply removing some of the Israeli restrictions on Palestinian trade and investment could allow the PA’s gross economy to swell by up to 10 percent. The PA joined UNCTAD in May, and has unilaterally joined international organizations in recent years as part of the diplomatic war it has been waging against Israel. At the same time, while blaming Israel for the PA’s financial woes, PA chairman Mahmoud Abbas continues to spend six percent of the PA’s annual budget to pay $4.5 million a month to jailed terrorists and another $6.5 million to their families. 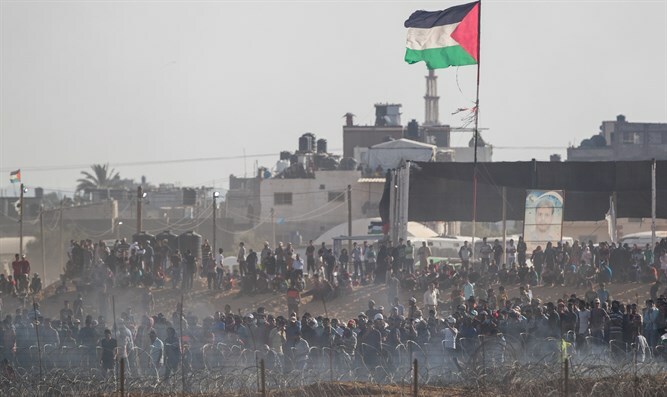 UNCTAD said in its report that removing restrictions on Gaza was particularly important, while warning that the Strip had been "reduced to a humanitarian case of profound suffering and aid dependency". Israel imposes a naval blockade on Gaza in order to prevent its Hamas terrorist rulers from smuggling weapons into the enclave. Despite the West’s claims that there is a “siege” on Gaza, Israel continues to regularly allow humanitarian aid and construction materials into Gaza, even though Hamas continues to attack southern Israel with rockets and openly threatens to destroy the Jewish state. Gaza’s other border, with Egypt, is mostly kept closed as well. Egypt blames Hamas terrorists for providing the weapons for a lethal 2014 attack, which killed 30 soldiers, through one of its smuggling tunnels under the border to Sinai. Hamas denies the allegations.